Rafael Nadal and Roger Federer will go head-to-head LIVE twice over two days, after the pair announced a charity double-header in aid of their respective foundations. After only four matches between the pair in the last two seasons, including the recent meeting at the Barclays ATP World Tour Finals in London, the world's top two players now play for charity in Zurich on 21st December 2010 from 19:30 GMT and then Madrid on 22nd December 2010 from 18:00 GMT. *TennisTV.com will stream both matches LIVE and in high quality! All proceeds raised from both matches will go to the Roger Federer Foundation and Fundación Rafa Nadal. You can watch these unmissable matches LIVE on TennisTV.com for $9.99/ €7.49 giving you access to both matches plus access to all TennisTV.com videos, including both matches available in full on demand, until 31st December 2010. Click here to donate to the Roger Federer Foundation. Click here to donate to the Fundación Rafa Nadal. 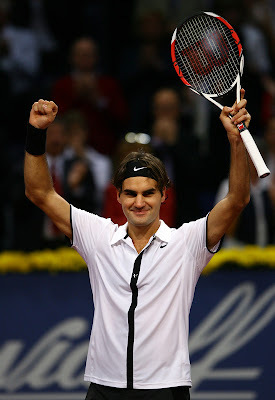 Please visit TennisTV.com for further details on how to watch this fantastic finale to the tennis year. Serbia beat France to win the biggest event in tennis - unless you're an American in which case Serbia won some meaningless Euro-centric thing which no one cares about. Whichever. It was a huge effort by the Serbian team of Novak Djokovic, Janko Tipsarevic, Viktor Troicki and Nenad Zimonjic with Troicki stepping up to win the deciding rubber against Llodra in Tipsarevic's place. They then celebrated by shaving their heads like all serious sports nuts should. Great effort guys. Pete Sampras lost all the tennis trophies that he won but didn't like enough to keep in his house where he could see them, all his memorable ones are still safe. Only one Major trophy was lost - the 1994 Australian Open - what was wrong with that one, we wonder? Presumedly they'll turn up as they are a little too unique to be sold by the thief. Roger Federer demonstrated that it matters not how many Majors you win in a year as long as you beat your nemesis in the final tournament. We'll give him a pass then. Still it was nice of Nadal to show up and win a few matches at least. So Fed's the man until we do it all again in January. Murray was the big disappointment of course and will continue to be right up until he wins something and then we will all dance about in congratulations, tweeting that we knew all along. Some of us may even learn to whistle. Next up is France versus Serbia which every analyst and their dog is saying will be an easy win for Serbia. Of course this depends which Janko Tipsarevic turns up. In other words France could do something here. Nadal beat a serve and volleying Roddick in three sets, so he's already one win ahead of last year. No doubt Maradona's presence inspired them all to greater heights (but hopefully not drug taking or cheating). Kylie Minogue was there too. Fed and Murray won their openers against Ferrer and Soderling. Ferrer is presumedly just there to make up the numbers but Murray appeared to play very well against Sod. He usually does this time of the year, it probably helps that it's not a Major and few people aprt from him and a lot of Brits care about who wins the end of year title. The Djoker beat Berdych also, showing at least he thinks he's in contention for the title. Does Roddick still think he is? Meanwhile Wozniacki used all of her skills at a exo against Azarenka. I'm pretty sure tennis was the winner. The dancing wonder Gael Monfils carved up the Greatest player of all time Roger Federer then choked before his adoring home crowd, losing the Paris final to Robin Soderling. Typical. Monfils has a load of charm, plays brilliant shots and entertains the crowd but lacks a certain consistancy - a bit like Fed used to be before he became Fed. The young Federer burst on the scene approximately 230 years ago as a talented shotmaker with no consistancy or discipline but then matured into the great unruffled perfectionist that we know and love and won himself countless titles and prizemoney. And now only a ruffled Spaniard stands between himself and immortality. Are we likely to see the same career progression for Monfils? Can he tame the wild beast within and advance from the entertainers to the winners? The almost great Elena Dementieva has retired (near) the top and we are one classy Russian the lesser. Much paper and cyberspace volume has been wasted describing how she failed to win a Major but all she ever wanted was an Olympic Gold medal (and a serve) and she won that years ago. Now mummy Vera can finally relax and Elena can start a family and begin a new life. All the best Elena. Meanwhile some other former retiree won the glamour bash in Doha. Poor Woz. Sharapova thinking of a career change? Sharapova like a cow on ice. Maria Sharapova is engaged to some basketballer who is even taller than her. I assume that narrowed the search down to basketball players and fairytale giants. So it's the Masha and Sasha show. Hopefully this is a good thing and Maria gets some well-needed support as she attempts to climb back up the rankings and seriously contend for the Majors again. Otherwise if it's another distraction like her marketing ventures and grunting controversies, then it probably won't last while also giving her morale a painful kick. Ana Ivanovic finally won something. The glamorous former trainwreck has at last regained some of her poise and confidence may have actually gained some speed around the court. She certainly ran over poor Patty Schnyder in the final of Linz. Is she now finally back to her best? Or will she hook up with a new boyfriend tomorrow and slink back down into the maelstrom of doubt, self-loathing and missed forehands? Stay tuned for the complusive viewing that is Ana Ivanovic. Not until next year though, she's finished with this one. See you in Perth Ana.